I just finished this book for our book club, and it was a a doozy! My copy was more than 600 pages. I don't have anything against long books in theory, but when it comes down to it I honestly do begrudge them their length. I used to pride myself on reading long books all the time (ahem, Wheel of Time series) but since then I've been shorter and shorter books (YA fiction, Juvenile Fiction, Graphic Novels). Now I respect a book that can tell a detailed story in few words. That's not this book -- but I liked it surprisingly well anyway. I had been warned before I started Wives and Daughters that author Elizabeth Gaskell died before she finished it. It was published as a serial in a magazine, a few chapters at a time over the course of some years, and the last chapter was never written. So I was prepared to imagine my own ending, and really one knows where the story is going in large part. However it was still a bit of a blow to go from Mrs. Gaskell's detailed writing to my own weak imaginings. Yes, I had heard there was no ending (and to watch the movie version, which has one) but I still expected there to be more of an ending than there was. Wives and Daughters is the story of Molly Gibson, daughter to the country doctor. Widowed Mr. Gibson remarries in Molly's teen years, mostly so that Molly will have a mother figure. His new wife, a widow herself, has a daughter about Molly's age. The book is about all of their relationships. Molly - our protagonist. Deadly serious and highly moral. Mr. Gibson - Molly's father. Humorous and highly moral. Mrs. Gibson - Molly's new stepmother. Silly and idiotic, occasionally harmful. Cynthia - Molly's new stepsister. Beautiful and charismatic, beloved by everyone despite her flighty nature. Roger - our love interest. Not handsome, but very pleasant and intelligent and moral. Osborne - Roger's older brother. A poet with a weak constitution and penchant for keeping secrets. Lady Harriet - Daughter of local nobility and my personal favorite. Humorous, silly even, but always charitable. From the movie, which I will be seeking out. 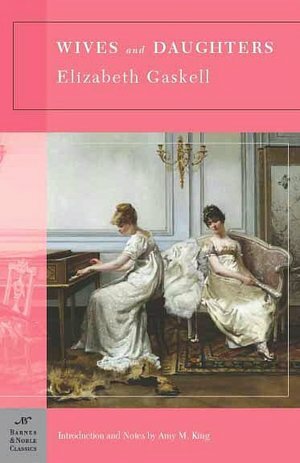 Mrs. Gaskell lived and wrote contemporary with the Bronte sisters, and this book, like Jane Austen's books is set in post-Napoleonic England. It has less of the dark mystery feel than Jane Eyre does, and rather more of the exposition and daily detail than Pride and Prejudice. My solitude requires a listener, to whom I may say, "How sweet is solitude." Incidentally, the book is past copyright and available for free online. I hope you enjoy as much as our book club did! What do you think? Will you be seeking out some more historical drama now that Downton Abbey is over for the season? Previously from Elizabeth Gaskell: Ashley reviews North and South. I think I will add this to my list. 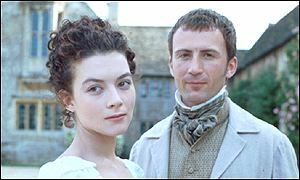 I never watched "Downton Abbey," mainly because I knew I would probably get really into it and don't have time right now (I guess that's the beauty of everything going to DVD; I know I can watch it eventually), but I love Jane Austen, Jane Eyre, etc.